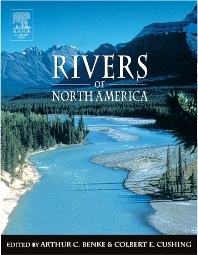 Rivers of North America is an important reference for scientists, ecologists, and students studying rivers and their ecosystems. It brings together information from several regional specialists on the major river basins of North America, presented in a large-format, full-color book. The introduction covers general aspects of geology, hydrology, ecology and human impacts on rivers. This is followed by 22 chapters on the major river basins. Each chapter begins with a full-page color photograph and includes several additional photographs within the text. These chapters feature three to five rivers of the basin/region, and cover several other rivers with one-page summaries. Rivers selected for coverage include the largest, the most natural, and the most affected by human impact. This one-of-a-kind resource is professionally illustrated with maps and color photographs of the key river basins. Readers can compare one river system to another in terms of its physiography, hydrology, ecology, biodiversity, and human impacts. Scientists, students, and river conservationists and ecologists. University of Alabama, Tuscaloosa, U.S.A.